The world (according to me) would be a considerably better place if we ate more cake. In fact, when asked once if I could make a rule for the world I had to think hard about it…but more cake was definitely somewhere in the answer. Making check-out chicks hand over your coins, then your notes, then your receipt would be high up there on my list of rules too. Why, after handing you your merchandise now carried in one hand, with wallet in the other, do people then insist on giving you three different things to wrestle with at the same time? When it comes to good rules the Spanish have got it right with the whole siesta thing, and the Italians take the entire summer off, as far as I can tell, and both these seem like good ones to impose. But we’re English. We don’t like change. So I think I would stick with the cake idea. And obviously tea. Henrietta Lovell has recently been extolling the virtues of The Good Stuff in a lovely article she has written for the latest edition of Fire and Knives (my most cherished foodie subscription). Her writing is steeped in an unwavering passion for real tea; not the kind that 97% of us apparently drink every day from “a teabag that dangles menstrually from a string”. According to Lovell it was little more than forty years ago that only 3% of us stooped so low. Her company www.rareteacompany.com will mail you some of the worlds’ most aromatic and sensual blends, including a jasmin silver tip scented over six nights with fresh flowers. How could you resist trying a tea that harks from a place known as the Abode of Clouds, nestled between Assam and Darjeeling. If you happily find yourself in the new Hix Restaurant in Selfridges be sure to try her breakfast tea; three single-estates that she blends specially for Mark. What is this Tea Tangent? I thought we were talking about cake? Well, what is tea without cake, or cake without tea for that matter? So my rule would be this: That a law be decreed that all humanity stop for tea and cake. That they stop. That they talk to those that they work with all day about something other than work. To savour a quiet moment, a stillness as they wait for the kettle to boil, enjoy the aroma of the ensuing brew, discuss the best way to pour it; should the milk go in first or last…Or at all? Is white tea just black tea with milk (Lovell would say god forbid), or an entire brave new world of delicate and aromatic real White Tea that is out there waiting to be rediscovered? The imposed therapy of standing patiently over a brewing teapot, warmed through first of course, has a restorative value that cannot be belittled; and only further enhanced by the drink itself. That it be one of those wonderful old 60s brownish metallic teapots that your grandmother had that never dripped, all the better. And then comes the discussion of the cake. Is it WI style coffee and walnut that teleports you from the drudgery of the office to your childhood ‘happy place’? A victoria sponge the way your grandmother made it; with lashings of proper whipped cream and homemade strawberry jam. A lemon drizzle, spiced orange, upside-down apple or good old fashioned gooey chocolate cake. For me, at the moment at least, it is only carrot cake that will do. 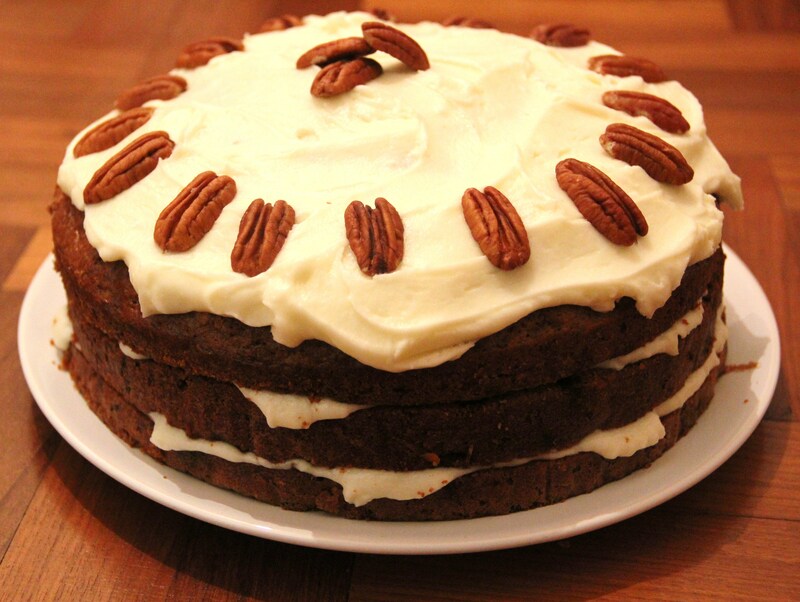 Serious Carrot Cake. Not the kind you can buy ready- made (they always skimp on the important ingredients). It has to be home made, and it has to be this recipe. 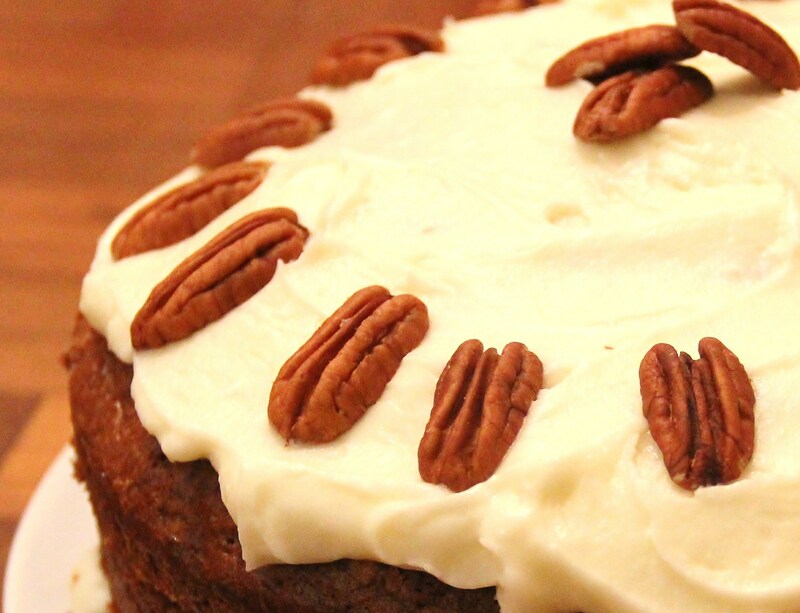 A combination of the lightest Californian carrot cake that I was taught at cookery school, and a dense spiced version that came from the kitchens of one of my first jobs, this is, as far as I am concerned, the way carrot cake should be. Topped with a cream cheese frosting stolen shamelessly from Tarek Malouf’s Hummingbird Bakery kitchens it is certainly a culinary combined effort! But then, most of the best things are. This volume of cake can make a large, tall classic carrot cake (9” or 23cm tin), or a mountain (24) of cupcakes. Sometimes I bake it in a tray bake and cut it into squares if making it for a party and don’t want to do the ubiquitous cupcake style. You don’t need a mixer for this cake, in fact you should do it entirely by hand (except, that is, for the frosting). Grease and line a 9” or 23 cm round cake tin. If using one that does not have a removable bottom, be sure to put two pieces of paper under the bottom circular disk that go down one side and up the other, enabling you to lift the cake out when cool. Combine all the first six dry ingredients in a large bowl and whisk together to ensure they are perfectly combined and aerated. Combine the eggs and oil in a separate bowl and whisk together until light and frothy. Combine the grated carrot, raisins and nuts in a further separate bowl and mix well. Add the egg and oil mixture to the powdered ingredients and stir together until a uniform batter is formed. Make sure there are no pockets of dry mix stuck at the bottom of bowl. When totally combined (make sure not to over-mix) stir in the carrot, fruit and nuts. Again, make sure that they are stirred in well and that the fruits are evenly distributed and well combined with the batter. Pour into the cake tin (I always put a little of the mixture into a cupcake case to bake just for me, especially if giving the whole cake away – such a shame not to taste all the hard work). Place in the middle of the oven and bake for about an hour and 15 minutes. If your oven runs hot be sure to place an oven tray at the top to help prevent the cake from browning, and do not be tempted to open the oven door during baking – it will collapse in the middle. It can take up to an hour and 45 mins if your oven is a little slow or if you are baking it in a thick, deep tin. Make sure you leave plenty of time to bake, cool and ice before you need to eat it! Remove when firm to the touch and a skewer comes out clean when inserted deep into the centre of the cake. While baking, make the frosting. Place the icing sugar and soft butter in a very large bowl if you are using a handheld mixer, or put into your stand mixer bowl. At slow speed combine the two ingredients until they resemble sand. Then tip in all the cream cheese and beat together until light and fluffy – for about three minutes. Take care not to overbeat as it will turn runny and you will have to start again. When completely cool, turn the cake out and cut with a very large, very sharp knife, horizontally (you can do this twice as shown in the picture if you are brave). Fill the centre with a large dollop of the frosting, taking care that you don’t spread it right to the edges (when you put the top half on the weight of the cake will push the filling to the edge). Top with the rest of the frosting, using the back of the spoon to make rustic waves, and finish with pecan halves denoting the portions. Serve with a cup of tea at four o’clock. oh i love this cake! but be warned it really does take an age to cook. mine took more like an hour and 40 mins but then again it could have been my oven. and the cake really must be absolute stone cold before you put the icing in the middle or the icing will melt and the cake will slide about (like mine did, i tried to make it in a rush. big mistake). but with those 2 caveats i shall make it again….and again…. and again. oh yes and if you follow these tips absolutely on the icing it will be perfect. So glad it was a hit! Depending on the depth/overall size of the tin, and obviously the fact that most ovens are not exactly precise, it will take a little longer or shorter to cook – perhaps a good idea to make sure you leave plenty of time to bake and assemble. I will amend time on recipe to take into account your findings! £75 Moroccan Feast Class. Come and immerse yourself in the scents of the Souk, learn the secret of Harissa and Perfect Cous Cous! I couldn’t help it . . .
Love is…a crate of tomatoes. heirlooms and wooden spoons by Laura Leaver is licensed under a Creative Commons Attribution-NonCommercial-NoDerivs 3.0 Unported License. Based on a work at www.heirloomsandwoodenspoons.wordpress.com. Permissions beyond the scope of this license may be available at www.heirloomsandwoodenspoons.com. Some of the Photographs taken on this site are particularly beautiful...in most cases that is because they have been taken by my friend (and very talented photographer) Rachel Caprio. Sometimes it takes someone else's extraordinary talent to truly see your own!